Did you know that all the parts of zucchini are edible, including the flesh, seeds, and even the skin? Zucchini is a staple at many farmers’ markets during the warmer months, and if you’re growing them in your own yard, you’re no stranger to the fact that they’re absolute MONSTERS by this time of the year. Zucchini boasts a rich nutritional profile and offers many health benefits thanks to its phytonutrients and mineral and vitamin content. It helps to promote eye health, and prevents all the diseases that occur from vitamin C deficiency like scurvy, sclerosis, and easy bruising. It helps to cure asthma and has a high content of vitamin C, carbohydrates, protein, and fiber. Zucchini contains significant quantities of potassium, folate, and vitamin A, all of which are important for baby’s health. 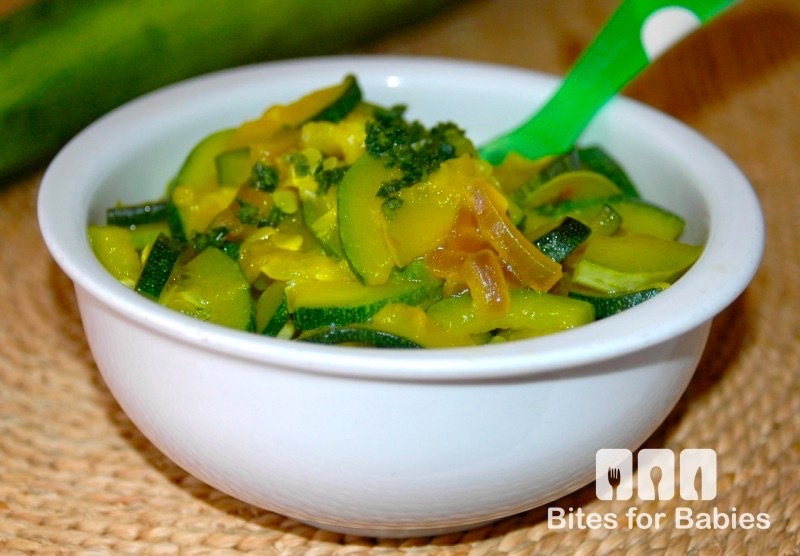 Zucchini is an ideal first food to serve to baby because of its mild, delicate flavour. Also, it pairs well with a variety of other veggies and herbs such as parsley, basil, and saffron. These simple, healthy recipes highlight the flavour of zucchini and provide a repertoire of meals for baby from first foods (purees) to dishes for more experienced eaters. 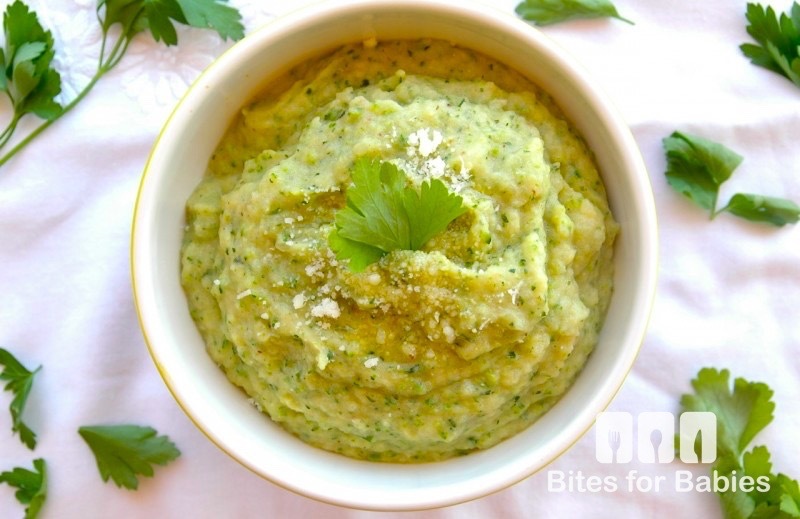 This wholesome puree has a mild, delicate flavour with a super creamy texture. The addition of parmesan, vegetable broth, and fresh herbs adds tang and brightens the dish. Step 1: Heat olive oil in a large frying pan on medium heat for 1–2 minutes. Step 2: Add the garlic and sauté for about 2 minutes, then add the zucchini and potatoes (they should be chopped uniformly in order to cook evenly). Continue to cook on medium heat for 15–20 minutes or until the veggies are fork tender. Step 3: Garnish with fresh parsley. Allow to cool for 5 minutes before serving. Step 4: Store in an airtight container in the fridge for up to 3 days or in the freezer for up to 3 months. 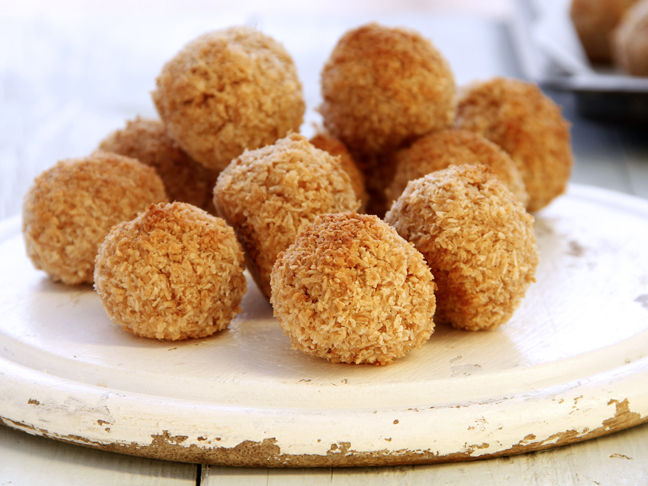 This is a great recipe for babies transitioning from purees to chunkier meals. It can be served chunky or pureed until super smooth, eaten alone, or mixed with grains or proteins. Get the recipe for Saffron Zucchini here. This is an ideal side dish for the entire family. Serve to self-feeders (who follow baby-led weaning) or set aside baby’s portion and puree it until smooth. Add some creamy cheese for a healthy dose of calcium and omega-3 fatty acids as well as a more flavourful, creamy texture. 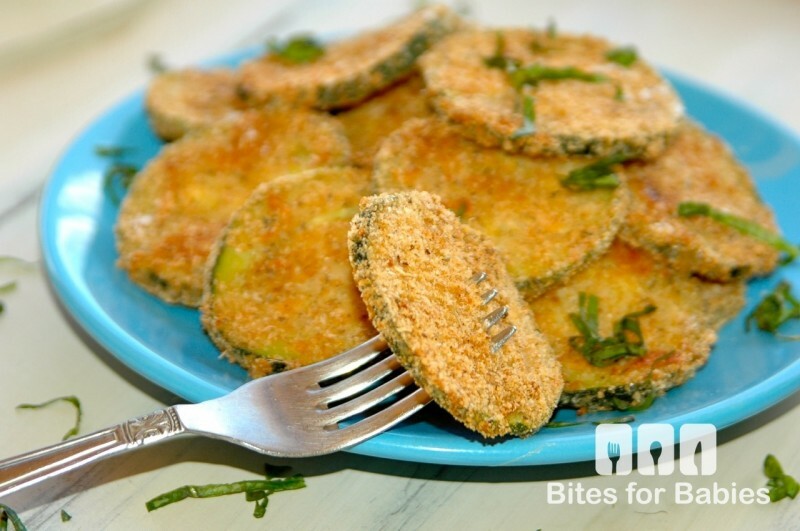 Get the recipe for Baked Zucchini Parmesan Medallions here.